Lengthy and Interesting Letter from Rebbe Meir of Premishlan – With Two of His Signatures – Segulah Letter and "Holy Amulet"
Lengthy letter (2 pages, approx. 26 lines), handwritten and signed twice by Rebbe Meir of Premishlan (Peremyshliany), addressed to his son-in-law and nephew, Rebbe Avraham. Summer 1837. The letter contains many blessings: "…please inform me of everyone's good health… With us there is life, with G-d's mercy until the coming of the Redeemer. And may we live in good health and strength to serve our Creator until the age of a hundred…". The letter then presents detailed instructions regarding renovations and building work being done in his home (the letter was presumably written from a different location where the Rebbe spent the end of the summer). Some of the instructions are based on kabbalistic principles and segulot. It appears from the letter that the Rebbe had a special Shabbat room which was not used during the week, and he instructs his son-in-law that they should live in that room during the renovation works on the rest of the house: "…please ensure that it be pleasing and beautiful, and to have it whitewashed, and only while the house is being whitewashed should they live in the Shabbat room, out of necessity, and it should be magnificent, since the High Holidays are approaching. May they be upon us and the Jewish people for good life. So are the words of your father-in-law and uncle, Meir son of the rabbi". The signature is followed by further instructions regarding the renovations in preparation for the holy festivals of Tishrei, addressed to other family members, his son and other sons-in-law – "and ensure that peace should reign, and that they should dwell in happiness…". Further in the letter is another signature: "Meir", followed by additional detailed instructions regarding the building works: "and they should distance themselves from theft, even of a penny…". 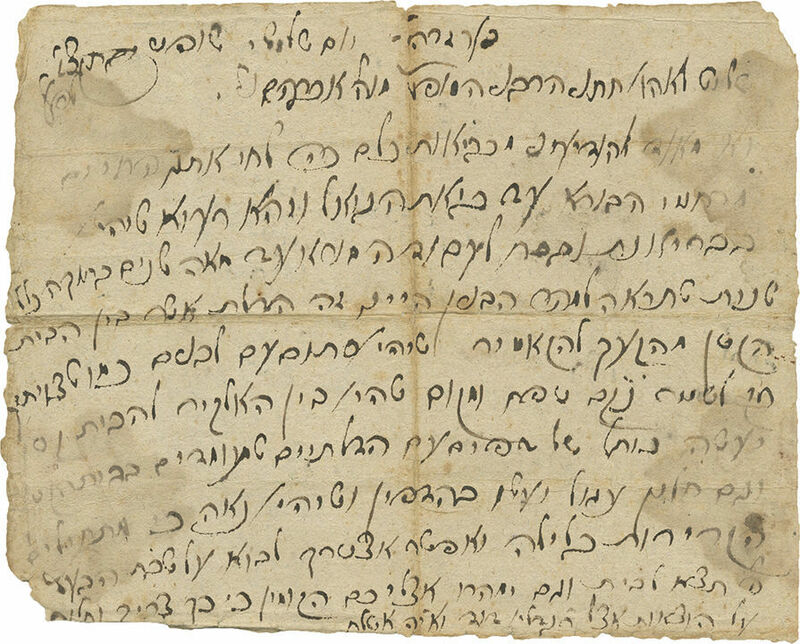 (In 1837, his great Beit Midrash was built in Premishlan, however this letter concerns the building works on his private home – a fact unknown to his biographers – see: M. Gerlitz, Aspaklaria HaMeira, Bnei Brak 1997, vol. II, beginning of chapter 26). Rebbe Meir of Premishlan (1783-1850), a foremost Chassidic luminary. He was the son of R. Aharon Leib of Premishlan and grandson of the great R. Meir of Premishlan (disciple of the Baal Shem Tov). His prime teacher was R. Mordechai of Kremenets (son of R. Michel of Zlotchov), but he frequented the court of the Chozeh of Lublin as well. He was particularly celebrated for his righteousness and his farseeing Divine Inspiration. He is credited with hundreds of stories of wonders and salvations. Renowned for his exceptional philanthropy, he would reputedly dispense all his possessions to charity without leaving a penny for himself, and would not go to sleep before having distributed all the charity monies in his possession. He was highly esteemed by one and all, and R. Shlomo Kluger, who was not a Chassid, eulogized him with great reverence, referring to him as "The celebrated, outstandingly righteous man, a G-dly person…and I have merited seeing him twice, it is like being in the Divine presence". Recipient of the letter: His son-in-law, Rebbe Chaim Avraham Redlich of Mykolaiv (d. 1871, Encyclopedia L'Chassidut, I, pp. 564-565). He was the grandson of R. Aharon Leib of Premishlan, and son-in-law of his uncle R. Meir of Premishlan. He succeeded his father-in-law R. Meir as rebbe, and most of the Premishlan Chassidim continued frequenting his court. He was also reputed as a wonder-worker, and just like his father-in-law, he would distribute all his money to charity. The family members and associates of R. Meir mentioned in the letter: His son R. Tzvi Hirsh (who passed away in his lifetime), his son-in-law R. Tzvi Hirsh Frankel (grandson of the Degel Machaneh Efraim), his daughter Rechel (wife of R. Yechiel Michel of Glina), his associates R. Zalman Shmuel and R. Avigdor (who are not known from other sources), his associate R. Gedalia David who sponsored the building expenses (this may be the philanthropist R. Gedalia of Skohl, a beneficiary of one of the wonder stories of R. Meir of Premishlan – see: Aspaklaria HaMeirah, II, pp. 377-381). leaf, written on both sides. 18X23 cm. Fair-good condition. Dampstains and folding marks. Wear and ink fading. The handwriting of R. Meir of Premishlan is considered by Chassidic leaders as a segulah and "holy amulet". R. Tzvi Hirsh of Liska (teacher of Rebbe Yeshaya of Kerestir) owned a letter from R. Meir of Premishlan, and he greatly cherished it – "The holy tzaddik R. Tzvi Hirsh of Liska had a letter handwritten by our rebbe in his possession, which he received as a gift from one of his Chassidim. He guarded this letter like the apple of his eye, and regarded it as a holy amulet. He would occasionally show it to one of his associates" (Aspaklaria HaMeira, I, p. 253).